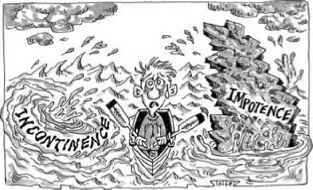 Incontinence and impotence are the two most-feared complications of prostate cancer treatment. They are the Scylla and Charybdis of prostate voyagers, and rare is the man who successfully sails by both without being affected by one or the other. Even men who elect watchful waiting as their option may experience them as their cancer increases in size. Although incontinence and impotence have been briefly discussed in preceding chapters, their importance for men with prostate cancer merits a chapter of their own. even the threat of death chilled me to the bone as much as the prospect of never being able to make love again.'' Many urologists agree that ''once the dust settles on issues of cancer control and incontinence, erectile dysfunction is the lingering quality of life compromise for many men. ''2 For any specific man, the choice of which is worse is usually easy to make: it is whichever affects him more.